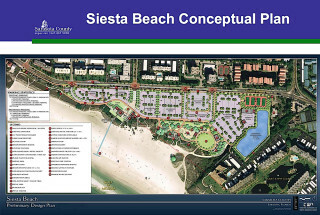 On Dec. 7, 2011, faced with more than a decade-long process to upgrade the facilities at Siesta Public Beach, the Sarasota County Commission took what some observers called a bold step: It unanimously approved a $1.4 million contract for design and permitting services that would allow the construction to be completed 10 years earlier than originally planned. “The quicker we get this project done, the better for the community,” then-Commissioner Joe Barbetta said prior to the vote. “It’s a No. 1 tourist attraction,” he added of the beach park. “To me, it’s like a gorgeous picture that deserves a gorgeous frame,” then-Commissioner Nora Patterson, a Siesta Key resident, added. Barbetta made the motion to award the contract to Kimley-Horn and Associates Inc. for the civil, landscape and architectural construction plans, final regulatory permitting, graphic design renderings and stakeholder outreach. It proved to be almost two years later before the board approved the guaranteed maximum price (GMP) of $17,459,051 for demolition and building to begin, with Jon F. Swift Inc. of Sarasota serving as the construction manager at risk. The latter board decision was to ensure the work came in on budget. A memo to the commissioners in advance of their Oct. 22, 2013 vote called for the project to be completed in 24 months. On Feb. 20 of this year, county staff will host the grand opening, Project Manager Brad Gaubatz, facilities manager in the Capital Projects division of the county’s Public Works Department, told about 30 members of the Siesta Key Association (SKA) at their regular meeting on Jan. 7. 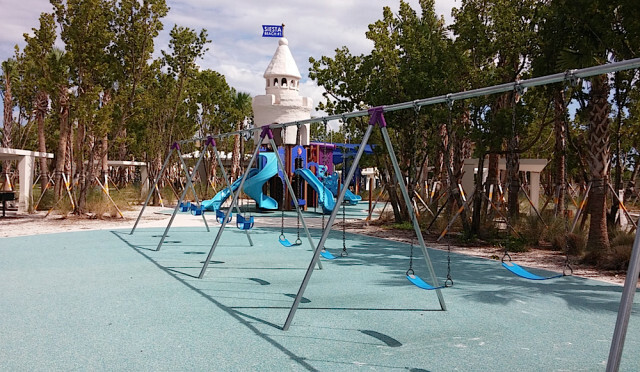 Although planning for the celebration is still under way, he said, the event will feature refreshments; demonstrations of volleyball, sandcastle building, yoga, kite flying and paddleboarding; and tours of the new facilities. One suggestion has called for each public participant to receive a “passport” he or she can get stamped at six locations in the park, to win a beach towel. Gaubatz cautioned, however, that that element of the event had not been identified as a certainty as of his SKA presentation. Former Commissioner Patterson, who attended the Jan. 7 SKA meeting, added that Tourist Development Tax revenue also was allocated to the work. 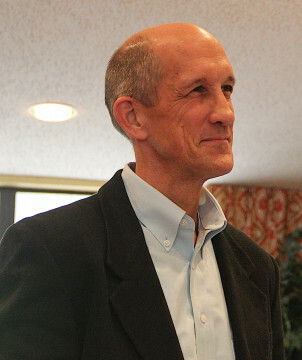 SKA member Bob Luckner, a member of the county’s Citizen Tax Oversight Committee, noted that funds brought in by the penny surtax voters approved in 2009 had been used for the project, too. Work continues on the historic pavilion and the Public Safety Building, Gaubatz continued. Floor-to-ceiling glass on three sides of that structure allows a visual survey of the park that encompasses more than 180 degrees, he added. “It’s amazing, the view you can see,” Gaubatz said. 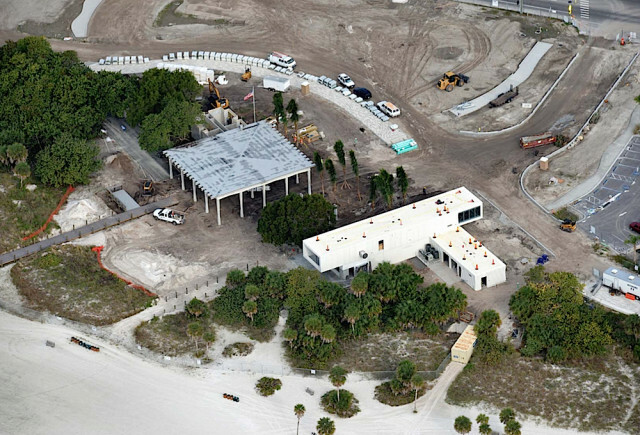 That new structure will serve as the island substation for the Sarasota County Sheriff’s Office, he noted, with the county’s lifeguards and a new concession area and first-aid clinic in other portions of the building. Thanks to a Nov. 10 vote of the County Commission, he said, pre-cast concrete picnic shelters made in St. Augustine will replace the wooden shelters on the western end of the park. Jon Swift employees have managed the project budget so well, Gaubatz continued, that funds also are available for the re-roofing of the historic pavilion as part of the renovations; the original timeline for that work was seven or eight years from now. The restrooms in that structure are being renovated, too, he told the audience, with a doubling of the number of fixtures. “My girls at my house — first thing they asked me about [was the restroom situation],” he said, prompting laughter. When she asked about security measures to make certain people do not sleep on the wall at night, after the parking lot closes at midnight, Gaubatz said the Sheriff’s Office will handle that. As for the parking: in response to another question, Gaubatz explained that because a pervious parking lot was constructed next to the stormwater system the county completed prior to the start of the beach improvements, more spaces could be incorporated into the park project. The total number of parking slots will rise from 837 to 980, county staff has told The Sarasota News Leader. However, Gaubatz noted, the other parking areas will not be of a similar nature as the new one. “It’s much more expensive than asphalt,” he said of pervious construction. “Imagine what would have happened to the tourist dollars,” SKA President Michael Shay responded. 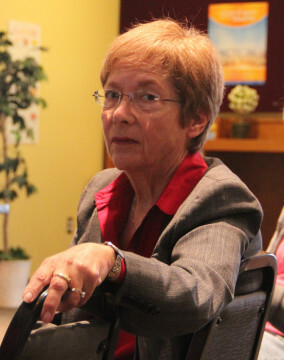 “Imagine what would have happened to the commission,” Patterson said, prompting laughter.